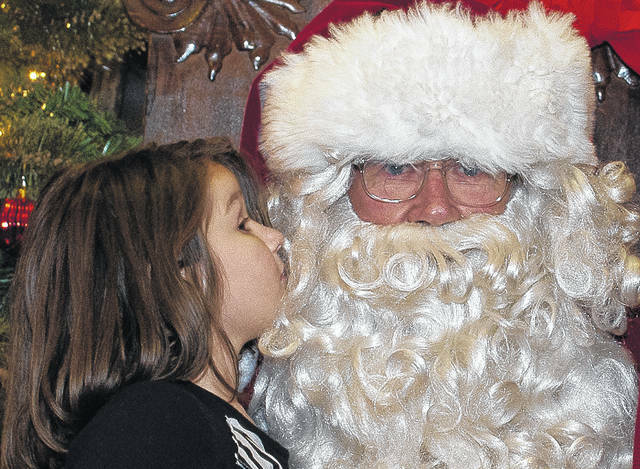 Leaning in close so only the Jolly Old Elf can hear, 6-year-old Dharma Piper of Delaware whispers her special list of gifts she would like to see under her tree on Christmas morning. Santa and Mrs. Claus spent Fridays in December visiting with the children that came to see the latest movies showing at The Strand Theatre. The younger children seemed more interested in Santa than the movies. Friday was the final day for Santa and Mrs. Claus to visit with kids at The Strand ahead of Christmas Day. This entry was tagged children, Christmas, Claus, delaware, families, holidays, kids, Movies, ohio, Santa, Strand Theatre. Bookmark the permalink.